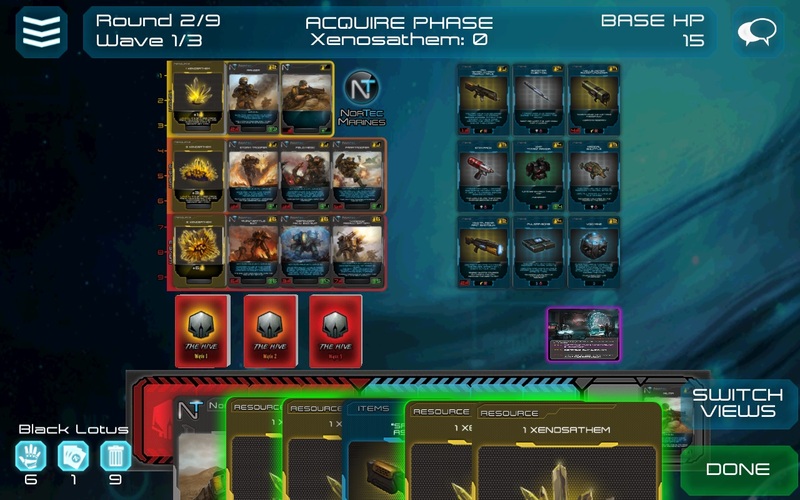 XenoShyft is a digital adaptation of a successfully Kickstarted card game by CoolMiniOrNot (CMON). The game is a science fiction themed cooperative game for up to four players who take on an invading horde of alien insectoid creatures. 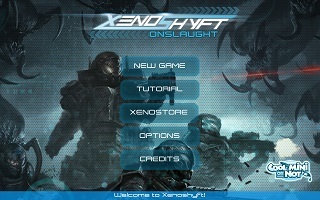 In XenoShyft, players take the roll of running one of four parts of a military base under attack by invaders. The game plays like a tower defense game combined with a deck building card game. Players use their basic cards to buy more advanced ones like in any deck builder, but can then use these purchased cards to not only buff themselves, but also their team mates. The enemy "hive" is controlled by a cleverly implemented AI that gets progressively harder in three phases, while the players decks and resources grow increasingly powerful at the same time. 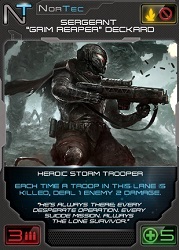 Players must leverage synergies between their units and buff cards to survive the enemy onslaught to win the game, lest they be over run by beasties and lose the game. After being Kickstarted, the physical game was met with largely positive reviews. The digital app version however got off to somewhat of a rough start. There were criticisms of bugs, poorly implemented rules, a lackluster user interface and general app instability. Undeterred, CoolMiniOrNot attacked these issues full force with a continuous stream of updates and fixes occurring quickly and frequently. These patches were released not only to address the aforementioned issues but also to add expansion material to the game free of charge, adding more value to the original purchase and to rectify the problems early adopters had to deal with. For this dedication CoolMiniOrNot should be commended, and what's better is that the app version has now evolved into a fine digital port of the highly touted original card game. Cool Mini Or Not have released an expansion for the digital version of XenoShyft called the NorTec Elite Pack. The expansion includes much of the exclusive content that was originally awarded to backers of the Kickstarter campaign for the original physical card game. The NorTec Elite Pack expansion brings 8 new hero units and 24 new experimental items, a new hero mechanic, and experimental versions of all items randomly included in item stacks. The expansion is available as an in-game purchase for $2 in both the iOS and Android versions of the game. Additionally, a Greenlight campaign has been started in an effort to get desktop versions of the game released on Steam. 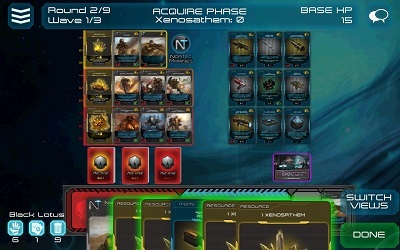 For more information about XenoShyft see the original post.